Caolán Irwin took another impressive Thundersport UK Supersport win at the latest rounds of the British Championship at Cadwell Park last weekend. Riding for Irwin Racing alongside his younger brother Rhys, Caolán took his Oasis Bar Letterkenny and Clean Rubber backed Yamaha to his second win of the season, with a lights to flag victory. Rhys also continued his fantastic run of form with three more podium finishes to take his 2017 tally to seven. 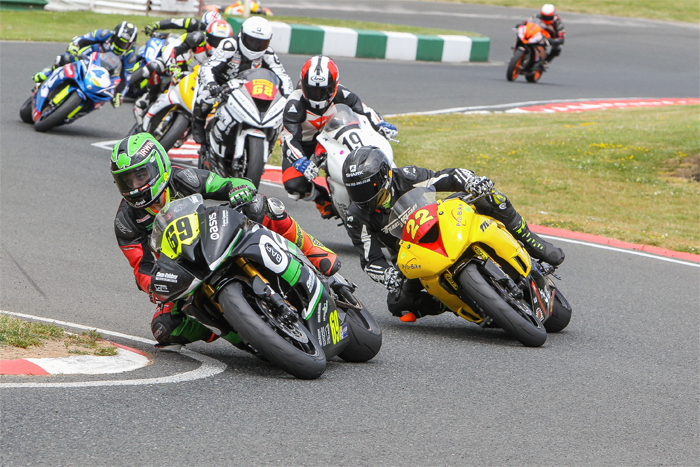 The Irwin brothers headed to Croft on a high following some fine performances at the Masters in Mondello Park just a few weeks ago, where Rhys set a new Lightweight Supersport lap record on his way to a hat-trick of wins and Caolán won two Supersport Cup races from three starts. Their good form continued in qualifying, with Caolán lining up fourth in Supersport and Rhys qualifying third in the Aprilia RRV450GP class. First to race was Rhys and a strong start saw him maintain his third place, which he converted to second by the end of lap three. Improving his lap times each lap, Rhys held second to the flag to pick up his fifth runner-up position in succession. The second race of the day for the Aprilia class saw Rhys again take second place as he continued to get used to his new machine, improving his lap time once again to go more than a second quicker than he had in qualifying. In between the Aprilia races Caolán Irwin lined up for the first of three Supersport races and took an instant lead following a perfect getaway. The race was stopped on lap three, but away from the restart the Donegal teenager again moved into the lead and held his advantage till the flag. Caolán lined up for the first of two Sunday races on the front row of the grid and once again led the way from the start. A small error was to ultimately result in the end of his weekend however, as a missed gear dropped him to third place and back in to the clutches of his rivals. Having fallen back into the pack the Donegal racer was pushed off track and the subsequent accident saw him knocked out temporarily and therefore disallowed from starting race three. Earlier, Rhys Irwin had continued to add to his podium tally with third place in Sunday’s first encounter, but distracted by his brothers trip to the medical centre he could only pick up fourth place in the final race of the weekend to leave Cadwell with three more podiums and third place in the championship. Following another successful weekend Irwin Racing will now take a break for almost a month. The team will be back in action at the end of June in the next round of the Thundersport UK championship at Mallory Park.